Developed central bank hawkishness has been increasing over the past weeks, signalling a new consensus (or groupthink) among global policymakers. Such a shift should not be too surprising, given the biases of central bankers. In particular, the shift by the Bank of Canada is a reversion to historical form; whether or not it will be disastrous remains to be seen. The Bank of Canada is yet again threatening to raise the policy rate. This has been an ongoing theme since the end of the Financial Crisis: the policy rate is always allegedly too low, but the Bank discovers that inflation is below target. 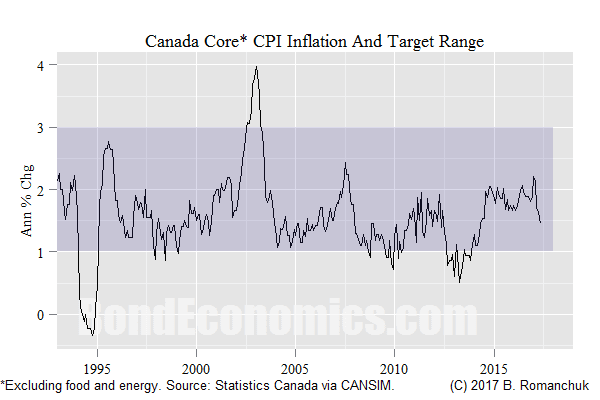 Inflation remains well below the 2% centre point of the Bank of Canada's target band (above). However, this is probably outweighed by the signs of the life in the labour market (unemployment rate below). I have been skeptical about Canadian growth prospects (and thus too dovish recently), but central bankers have a much less relaxed attitude about the potential for rising inflation. As a result, a move towards rate hikes is not surprising given the data flow. Even though I agree that raising the Canadian policy rate is a negative for growth, I still doubt the conventional belief about the transmission mechanism. The conventional story depends upon who you are talking to, but the operational result is similar: raising the policy rate will (somehow) dampen inflation and/or inflation expectations, and this will then translate into a smooth effect (somehow) on real GDP growth: "raising the policy rate by X basis points will lower real GDP by Y basis points on a horizon of Z months" (X, Y, Z depending upon whatever econometric story the author believes). My view is more "non-linear": raising the policy rate raises the unknown probability of a housing market disaster. The exact magnitude of this "disaster" is frankly unknown; it could be a complete meltdown (as seen in some countries after the Financial Crisis), or a worsening of the zombification of the Canadian middle class. That is, the financial system and regulators will finally admit that there is no way that Canadian consumers will ever pay back their mortgages in full, and the process of loss-mitigation will start. New credit flow will be a trickle, and a slow debt workout process would start. This debt workout would effectively act like a massive hidden tax on the household sector, and the consensus will be continuously surprised by the underperformance of the Canadian economy (extending their forecast track record for the past decade). However, I have my doubts that the Bank of Canada would hike by enough to precipitate a housing market collapse single-handed. The pace of rate hikes are likely to remain tepid, and the animal spirits in the housing market may be able to survive a policy rate of up to 5%. (Please note that 5% figure is a wild guess based on my reading of household interest burden data.) A mild rate hike path (50-75 basis points per year) would have only a limited effect on housing affordability, and would in fact offer a signal about the central bank's confidence in the economic outlook. If you insist in looking at the effect of policy rate changes on the economy in a marginal manner, the result is that a rate hike may raise growth and inflation on a short forecast horizon -- conditional on a housing crash not being triggered. The ambiguity in my views regarding the effect of rates on the Canadian housing market may distress many readers. 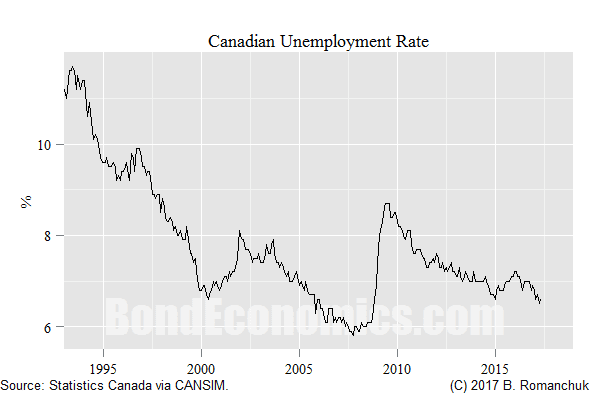 Some Canadian commentators have been arguing (for years) that the policy rate would go up, and crush the housing market. They point to the constant stream of commentary from real estate brokers stating that low interest rates are a good reason to buy a home. However, the reality is that real estate broker paid commentary will always conclude that it is a good time to buy (or sell) a house. If the policy rate goes up, all that will happen is that the story will change. The belief that risk asset markets mechanically follow central bank policy is just an artefact of the incessant repetition of the of central bank assets/equity market price chart by unscrupulous commentators. (During any expansion, it is always possible to find time series that correlate with each other.) By contrast, during the tech stock bubble, tech stock strategists laughed off the Fed tightening cycle. There is no reason to believe that a few Bank of Canada rate hikes would be enough to puncture housing market confidence, since the absolute level of interest rates is still laughably low, and everyone knows that. Although I believe that inflation would likely remain anchored even if growth remains relatively strong, the risk remains that noise in the data could push up various inflation measures. (Canada's economic data tends to be noisier than American data.) In the current environment, this would push the hawks at the central banks (and in the bond markets) over the edge. This could cause a disorderly back up in bond yields (and hence term mortgage rates), which might generate enough scary headlines to destabilise the housing market. I am not sure what the odds are of such a scenario, but it seems that a more gradual drip feed of policy rate hikes should be base case. In that base case, bond yields will rise, but there would be less risk of contagion (since most people reasonably do not care about the bond market).